From Tracie: Do I Look Like A Celebrity? Recently there were a lot of bloggers putting up posts with pictures of their celebrity look-alikes. I did not participate, because I wasn't sure that I looked like anyone other than myself. Last night, Lori Dyan followed me on twitter, and when I was snooping around her blog (you know, checking to make sure she wasn't a serial killer or anything.......um, Lori, you aren't a serial killer, right?) I found a post where she used this snazzy facial recognition stuff, and I had to try it out. I'm not really sure that I actually look like any of those women, but if someone wants to compare me to Olivia de Havilland, I'm certainly not going to complain. Notice how Katarina also looks like Katie Holmes. Clearly we are related. I mean, Katarina and I are related to each other - I'm pretty sure we aren't related to Katie Holmes. Thomas mostly looks like people I have never heard of. I looked up Mark Feehily and Carl Nielsen, and found out they are musicians, which is kind of fun, because Thomas is musical. I'm thinking their musical gifting has something to do with the shape of their noses. This theory totally explains my lack of a record deal. I'm blaming my nose. There was a darker side to this picture comparison. Something that I did not anticipate. 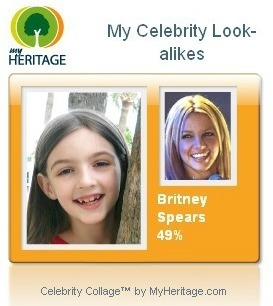 We are a whole family of Spears look-alikes! I'm not sure how I should feel about that. I'm really not sure how I feel about looking like Jamie Lynn Spears, when Thomas and Katarina look like Britney. I think I might need to shave my head and start attacking cars with umbrellas to up my Spears Family standing. Or maybe get a nose job, because musical talent is clearly related to nose shape. What do you think? 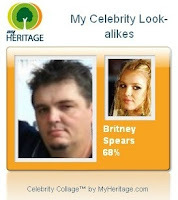 Which one of my celebrity look-alikes looks most like me? p.s. NOT a serial killer...but quite possibly a cereal killer, as in, "Last night I killed that bowl of Honey Nut Cheerios." HILARIOUS! You know I'm about to go play with this look-a-like thing! FUN! I wonder how many dudes I'll match up with since I have short hair now? ROFL! Hmm...I bet if I go do it, they will just tell me I look like The Unknown Comic. Oh, my gosh...the whole Spears family. Now really, that is funny. ps If I looked even remotely anything like Scarlet J. I'd be thrilled so a big high five over the internet! I'm sure he's loving looking like Britney! I can see resemblances with you in a few of the photos. I look a lot like Rose Byrne, from Damages. Like, my friend says she can't watch the show without thinking of me.